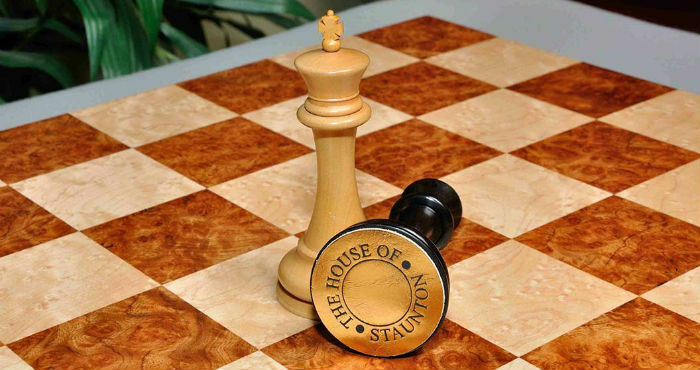 A list of luxury wooden chess pieces made of the finest and rarest wood types. Maple wood is a hardwood that can be harvested from more than 128 different species of trees that can be found all over Asia, Europe, Africa, and North America. 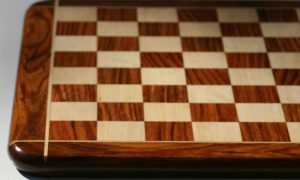 Because of its wide availability, it is a common choice for wooden chess boards and wooden chess pieces. It is also prized for its unique light coloration that makes it perfect for representing the White army. Ebony is in many ways the opposite of Maple. It is quite scarce and is native to the southern areas of India and Sri Lanka. 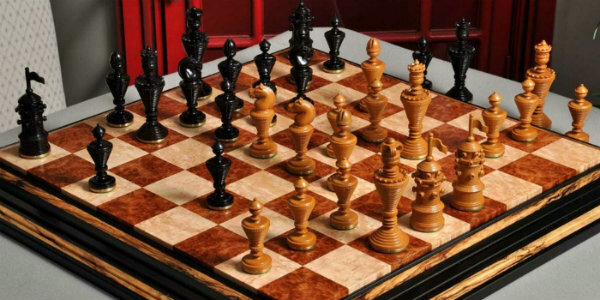 This dense, darkly colored wood has the unique quality of sinking in water and is prized by chess makers for its extremely dark coloration that makes it perfect to represent the Black army. Ebony is highly prized as a luxury ornamental wood and can be quite expensive. When it comes to the pinnacle of luxury wooden chess pieces, there can only be one. And the Golden Collector Series Luxury Chess Pieces set is it. Every little detail on this set is made with such care and attention that the finished product is nothing short of a work of art. 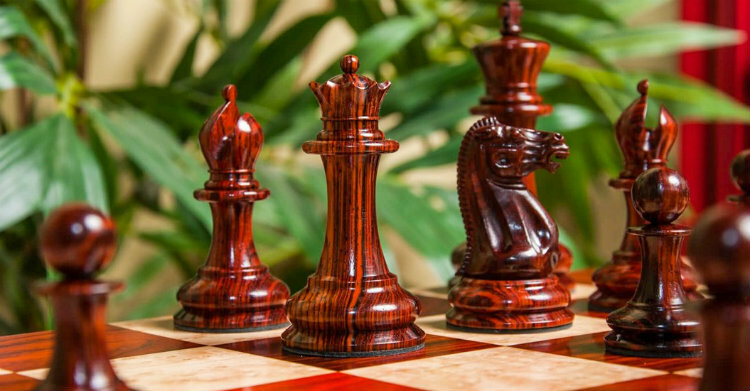 The intricate details carved into each wood chess piece, the smoothing and finishing, and the perfect weighting of each piece are all meticulously overseen by artisans who want each set to be as perfect as humanly possible. 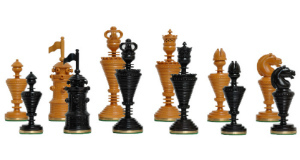 No luxury was spared in the creation of this set of wooden chess pieces. Even small things like the base pads on the bottom of each piece are made with genuine leather instead of the typical green felt. Each set of Golden Collector Series Luxury Chess Pieces also comes with a certificate of authenticity, an engraved plaque, and an individual product number. Each set includes an original manufacturer’s plaque. This detailed documentation allows you to trace the line of production all the way back to the beginning to be sure that you have a genuine set and not a cheap knockoff or reproduction. This preserves the prestige of your set, as well as the resale value should you ever want to part with it and put it up for sale. Though this set of wood chess pieces is gorgeous all on its own, you won’t be able to properly display or play without a good chess board. A complementary board may be purchased along with the pieces for a discounted rate if you choose. With wood chess pieces of this quality, proper storage and care is an absolute must. You will want to keep your pieces in a padded chess box with a dedicated slot for each piece. Luckily, one such box can be purchased for a discount along with these wooden chess pieces. 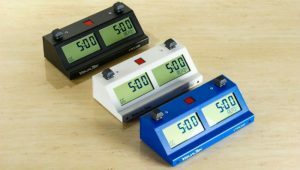 Not only will you be getting a great deal on the box, you won’t have to worry about checking any measurements to be sure the 4.4” King pieces will fit. When you buy as a set, the pieces are guaranteed to fit! The Benvento Series Artisan Chess Pieces are one of the bestselling products in the entire Forever Collection, and it’s easy to see why. They are absolutely stunning chessmen with beautiful shapes and expertly carved detail work. The Knight pieces alone are worthy of a spot in an art museum! It’s almost hard to believe that something this beautiful is available for sale. 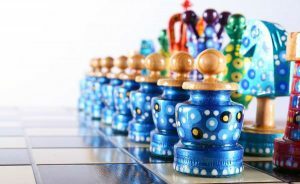 The makers are very proud of The Benvento Series Artisan Chess Pieces as well – they say themselves that this set is one of the finest chess sets ever produced by The House of Staunton. If you’re familiar with HoS products at all, you’ll know that that’s really saying something! Even more surprising is the fact that this set isn’t even the most expensive thing that The House of Staunton sells – not even close! So, that means you can get one of the best sets from one of the best brands at an incredible value. We’re not sure how long a deal like that will last! A bit more about the wood chess pieces: they are hand carved from the finest materials. White’s army is made from Natural Boxwood, and for Black’s army, you can choose between Genuine Ebony and Blood Rosewood. The Ebony provides a rich, dark contrast to the creamy Boxwood, while Blood Rosewood has a dramatic red hue. One of the finest chess sets ever produced by The House of Staunton. This set of wooden chess pieces also comes with a free chess box (a $249 value) to keep your pieces perfectly protected while they’re in storage – that is, if you can ever get yourself to put them out of sight! This box is spacious enough to accommodate the 4.4” King pieces with no problem. The pieces also come with a lifetime guarantee against hairline cracks, so if anything ever does happen to them, your investment will be protected. It just doesn’t get better than that! Also included with this set are an individual production number, engraved plaque, and certificate of authenticity. You may choose to add a matching chess board at a discounted rate. Including a Free Chess Box! 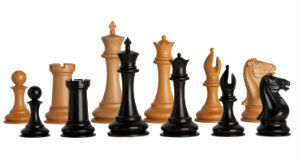 The Anglo-Dutch Reproduction Luxury Wood Chess Pieces set is one of the most unique sets of wooden chess pieces for sale in 2019. The Anglo-Dutch Reproduction Luxury Wood Chess Pieces look nothing like the traditional Staunton pattern chessmen that everyone is used to seeing. 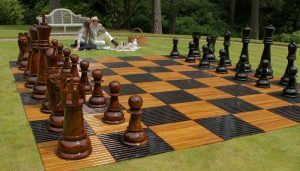 In fact, they are modelled after German and Dutch old wooden chess pieces that were fashionable between the late 1700’s and the mid 1800’s, making their way onto the English markets during that time. Unfortunately, the designs by German and Dutch artists were intricate and pleasant to look at, but they lacked the stability and board presence necessary to make them a joy to play with. British artisans took this as a challenge and set about making wooden chess pieces that were every bit as intricate but had superior stability and presence. Now, The House of Staunton’s artisans are recreating those improved designs and making them available for sale once more. This unique set will certainly stand out in any room, and you’re bound to get a lot of questions and compliments on it. If you’re someone who’s looking for a luxurious and well-made set of wooden chess pieces that breaks the typical mold, this is the perfect set for you. If you do choose to purchase this set, you will also have the option of adding on a chessboard and chess storage box at a discounted rate. 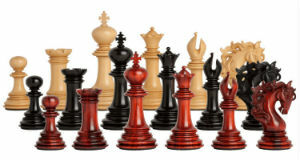 The 4” Alexander Staunton Ebony Wood Chess Pieces are a set of chess pieces that embody elegance. They are delicately carved and finished with a smooth, glossy shine that is very classy. 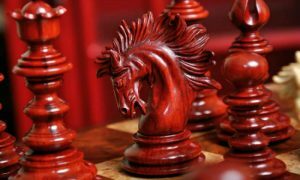 The design of The Alexander Staunton Ebony Wood Chess Pieces also features a unique Knight piece that actually shows the full body of a horse rearing up on its hind legs, rather than the more typical stylized horse head. Other than this small variation, the rest of the pieces are modelled quite closely off the Staunton pattern. It’s close enough to be easily recognizable, with just a little pop of uniqueness to make this wooden chess piece set one of a kind. chess box with two trays for storing each army of wooden chess pieces. This lovely set is the epitome of simple elegance and would make a wonderful addition to any home or office! We highly recommend it. The popularity of wooden chess pieces has endured for hundreds of years and is likely to endure for hundreds more. Simply put, wood chess pieces are not going out of style anytime soon. 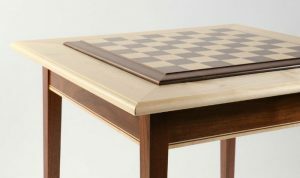 The warmth and natural beauty of wood makes it a great match for almost any style of chess board or home decor. Wood quality is probably the biggest single factor in determining the overall quality of a set of carved wooden chess pieces. You certainly won’t find any wood-veneered chessmen on our list. 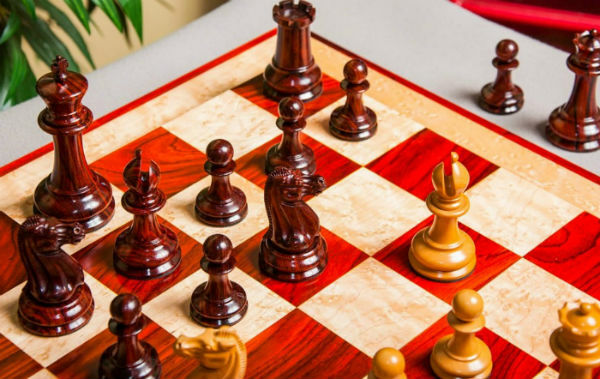 Solid wood is the way to go if you’re looking for high quality chess pieces that will last you a long time and stay looking in good condition. You can get good quality wooden chess pieces without spending a fortune. A high-quality maple can offer just as much longevity and beauty as a premium ebony wood at a lower price point. Budget shoppers, don’t worry – you don’t need to buy expensive woods to get a good set of handmade wooden chess pieces. We always check to make sure that our listed wooden chess pieces are for sale at a reasonable price. 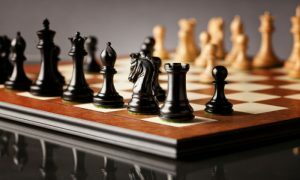 Now, what’s a reasonable price is dependent upon what materials are used in the wood chess pieces set and the level of craftsmanship, but we’ll always make sure that the price is justified to ensure you get the most bang for your buck. Finding the perfect set of carved wooden chess pieces can be hard, especially when there are so many for sale. But you don’t need to choose blindly and just hope for the best! Our reviews can point you toward the best wooden pieces in each category at a variety of different price points. 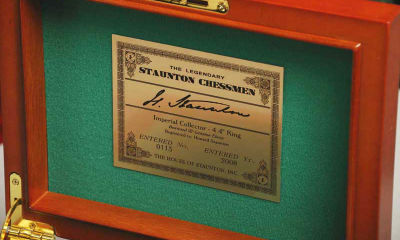 I am looking for a full set of wood unfinished tournament Staunton chessmen. Standard 3-3/4″ with king base diameter of 1-1/2″, double weighted if possible. I can’t seem to find any that are available. Please advise if you can send me info. Price range less than $100.00 for a full set. There are many more that fit your specifications on HOS website.